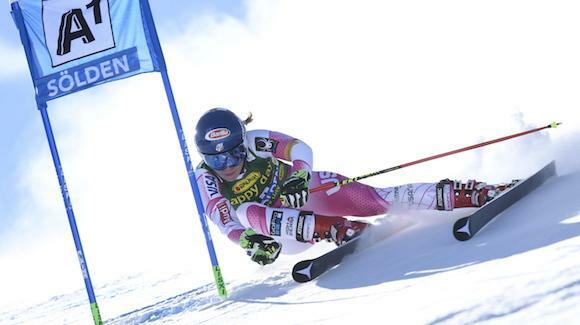 Mikaela Shiffrin of Eagle-Vail claimed second in the opening World Cup giant slalom in Soelden, Austria, on Saturday (U.S. Ski Team photo). Eagle-Vail’s Mikaela Shiffrin on Saturday repeated last year’s second-place finish in the season-opening World Cup giant slalom at Soelden, Austria. Shiffrin last won the race, her only career GS victory, in 2014. SOELDEN, Austria (October 22, 2016) – Mikaela Shiffrin (Eagle-Vail, CO) kicked off the season with a bang, nailing the podium at the Audi FIS Ski World Cup giant slalom in Soelden, taking second place. Lara Gut of Austria dominated the race, winning by 1.44 seconds. It was a beautiful bluebird day with grippy snow, and Gut—last season’s overall World Cup winner—took advantage of the conditions. Shiffrin looked strong after starting 16th first run, but couldn’t keep up with Gut’s flawless first run. Gut led Shiffrin by 1.42 seconds after the first run and while Shiffrin stayed on her heels second run, the lead was too great and Gut nabbed the win. Behind Shiffrin was Marta Bassino of Italy, who stepped on her first World Cup podium in third place. The women have a break before heading to Levi, Finland on November 12 for a slalom and then come back to the U.S. for the Killington World Cup. The men race giant slalom Sunday with Ted Ligety (Park City, UT) going for the win. Stream the race live on nbcsports.com and watch the race on NBCSN at 9:30 p.m. ET.